From humble beginnings to a confident future. Headquartered in Lubbock, Texas, City Bank has more than $2.5 billion in assets with 24 branch locations and 16 mortgage locations throughout Texas and New Mexico. Since 1941, City Bank has been committed to offering its customers revolutionary products and services to stay in touch with their needs. Through this commitment, City Bank offers additional banking services including mortgage lending, trust, insurance, investments, indirect lending and private banking. The management team, along with its employees, has created an exceptional, engaged, innovative, and genuine experience unique to City Bank. Our core philosophies and culture have lead to an experience for our customers that has become synonymous with City Bank. We are a passionate group, compelled to deliver the most genuine experience, impeccable service and innovative products. At the same time, our people solidify our role as the genuine, trustworthy financial institution that we are. All of these qualities have not only heightened our reputation among customers, it has created a workplace that fosters a culture our employees are proud to be a part of. Recently, City Bank was recognized as one of the best companies to work for by American Banker for a third year in a row. The institution known today as City Bank had its beginnings on August 2, 1941, in a small West Texas town where five men founded the First State Bank of Morton. The bank was originally capitalized with $129,335.48. By the end of 1942, the bank had just over $1 million in assets. During its first five years, the bank had an armed robbery and a major fire, but by the end of 1946, the bank had more than $2 million in deposits. During the next 10 years, the bank grew and in May of 1957, moved into its present location in Morton, Texas. On August 28, 1962, a group of local businessmen and farmers, including D. E. (Gene) Benham, and J. K. Griffith, purchased the bank from its founders. The bank had just over $4 million dollars in assets. Mr. Benham became president and led us with great distinction for the next 22 years. During that time, he not only kept the bank strong and profitable, he was very active in area, state and national banking organizations. He was one of the founders of both the Independent Bankers Association of Texas and the Texas Independent Bank, the first “bankers’ bank” in the nation. He also served as president of IBAT in 1975-76. Mr. Benham’s principles of community banking and his example has always inspired us. When Mr. Benham retired in early 1985, James Dewbre became president. He had started as a bookkeeper (and janitor) in 1957, and eventually held almost every possible position in the bank. Mike Liner followed James as president in January 1990. The bank then had more than $40 million in total assets. Mike served as president/CEO for the next 18 years, providing outstanding leadership as we grew from a small-town bank with two locations into one of the largest financial organizations in the region. Mike moved to the position of Vice-Chairman in 2008, and into retirement in 2011, and was replaced by our current president/CEO, Cory T. Newsom. In 1984, Security National Bank in Lubbock was the first bank in the region to fail. At the FDIC auction, the winning bid came from Bill Loyd, who had previously owned banks in Plains, Muleshoe, Dimmitt and Clovis, New Mexico. City Bank was his third choice of possible names for his new bank, but the FDIC would not let him use either of the first two. At the time, the bank was located in a building at the southwest corner of Slide Road and Brownfield Highway. The current building was under construction, but after the Dallas-based bank financing the building also failed, construction was completed with funding by the FDIC. Most of the original plans were followed, including the “S” (for Security National Bank) in the exterior door handles still in place on the south and south- east doors. Mr. Loyd eventually agreed to lease space for City Bank in the building and, in 1991, finally bought it from the FDIC for much less than it had cost to build. In late 1992, Mr. Loyd agreed in principle to sell City Bank to another Lubbock bank, but a disagreement disrupted the sale in early 1993. Mike Liner heard about the situation and asked Curtis Griffith to talk to Mr. Loyd the next time he was in Lubbock to see if he still wanted to sell thinking Lubbock would prove to be a good central location from which to make farm loans to the entire South Plains. Later that same day and after 45 minutes of discussion, a handshake deal was done. Mike and Curtis spent much of that summer learning about banking in the Lubbock area. The acquisition took place in October 1993, and Cory Newsom had become City Bank’s cashier after leaving his position as cashier in Levelland, Texas. At the closing, City Bank had more than $80 million in assets. By the end of 1994, this family of banks—including Morton and Levelland—had total assets of $200 million. Between 1995 and 2008, seven locations were added in Lubbock, six on the South Plains (four of which were sold in 2010) and nine other full-service locations in College Station, Dallas, El Paso (2), Forney, Grand Prairie, Houston, and Plano. In 2001, City Bank chartered a bank in Ruidoso, New Mexico, which became the largest bank in Lincoln County. Its three locations became branches of City Bank in 2014. In 2015, a second location opened in Dallas in the Uptown area. City Bank’s Mortgage division also maintains non-bank offices in Abilene, Arlington, Austin, Beaumont, College Station, Dallas, El Paso, Forney, Houston, Lubbock, Plano, Ruidoso, and Southlake. Besides the addition of new locations, City Bank has grown as an organization in many other ways. Our agricultural, consumer, commercial and real estate loan officers oversee approximately $2 billion in loans. City Bank also serves 25 other banks through its correspondent banking department, one of the largest in the region. Additionally, CityBank’s Wealth Management department manages more than $250 million in assets, more than $220 million in customer investment accounts, and $270 million in deposits. The City Bank Indirect Lending department is one of the largest in the area and services about $75 million in auto loans. City Bank maintains a state-of-the-art product development infrastructure. The enterprise technology team has assisted the electronic banking division in delivering some of the most innovative products in recent years, including an award-winning mobile app. City Bank was one of the first Texas banks to sell crop insurance through its Windmark Insurance agency which now provide services in 15 states. City Bank was also the first bank in Texas to partner with an existing insurance agency, Ashmore & Associates, to provide a wide range of insurance products, including life, health, long-term care, property and casualty. Like all banks, City Bank is governed by a board of directors. Some of these board members have been with the company since the 1980s, some joined when branches were added in the 1990s, and some are employed by the bank today. Collectively, they have almost 300 years of experience with the institution. In more than 20 years, City Bank has grown from barely $40 million to more than $2.5 billion in assets. Along the way, the City Bank family has grown from 20 to more than 600 employees. Together, they make up the finest group of financial talent in the Southwest. City Bank’s success as an organization depends upon hiring, training, and retaining the very best people. The world, and banking in particular, is changing very rapidly. City Bank will strive to provide its customers with the best possible combination of safety, convenience and innovation in all of its financial products and services. As a company, City Bank will continue to focus on meeting the financial needs of all our many communities in a manner that will keep deposits safe and provide a good return on the investment of shareholders. For managers of this company, there is a focus on providing employees with the best possible working environment, with good pay and benefits and opportunities for growth and advancement. In return, City Bank expects its employees to focus on doing their very best to provide unsurpassed service to its most important asset, our customers. This is City Bank’s heritage and, most importantly, this is our future. 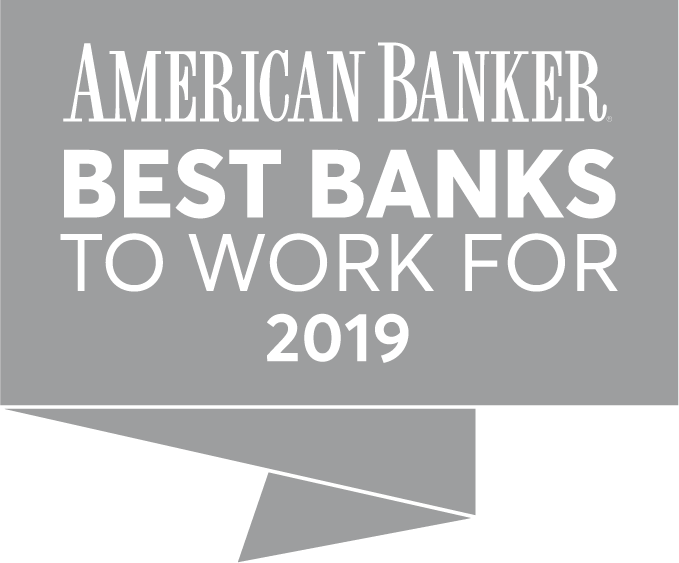 City Bank was named among the “Best Banks to Work For 2018” by American Banker and Best Companies Group for a second time. City Bank credits its company culture and employee-focused programs as two of the many reasons the Bank has received this distinct award six years in a row. Our people, passion and unique corporate culture create a special environment we are all very proud of. City Bank promotes a corporate lifestyle that goes well beyond the workplace with a variety of family-friendly events and unique opportunities for its employees. Among these is its Wellness Program, an internal initiative implemented in the 1990s which pays incentives to employees for engaging in healthful lifestyle choices. In all, it’s evident the passion that goes into making City Bank such a great place to work creates a positive impact in the lives of our employees and their families. The selection process for this annual award is a two-step process. A Best Companies Group panel first evaluates each participating bank’s workplace policies, practices and demographics, and then issues an employee survey aimed at assessing the experiences and attitudes of individual employees with respect to their workplace. The panel manages the registration and survey processes, and then analyzes the data collected, using its expertise to determine the final ranking.